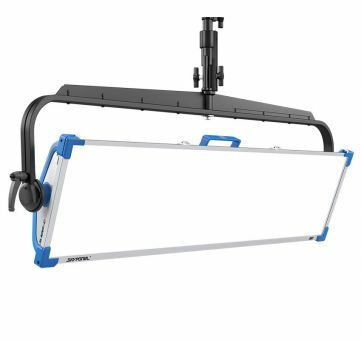 The highly acclaimed ARRI SkyPanel series of LED soft lights is growing, with the new SkyPanel S120-C joining the S60 and S30 family of products. The S120 is twice as long as the S60, but weighs nearly the same. Its larger light aperture makes a great soft light even better. Retaining the same features and color tuneability as its smaller counterparts, the S120 consumes less than 400 watts, yet it is slightly brighter than the S60-C and has an outstanding efficacy of 90 lumens per watt. A large surface area is a crucial feature of a good soft light. With an aperture of 1290 mm x 300 mm (50.8” x 11.8”), the S120 outputs a beautifully soft, even beam of light that has a wide range of uses. The long aspect ratio wraps light around objects and is perfect for vertical lighting of people. In addition the S120 works well as an overhead light for large areas, with the increased dimensions meaning that fewer lights and less cables are required.